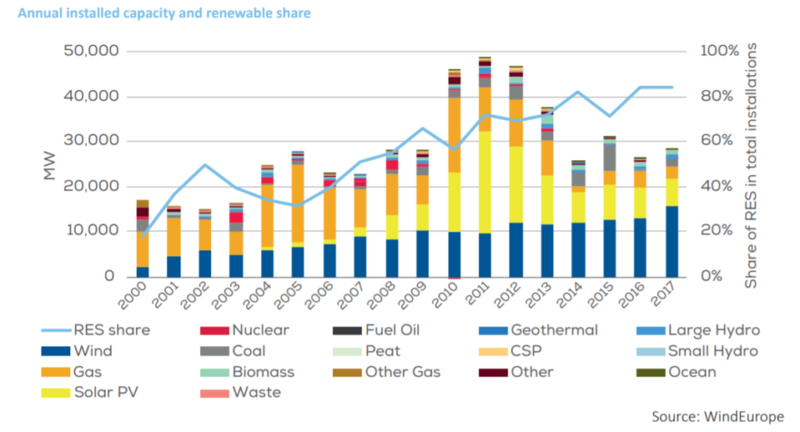 2.1: What has the “renewables (RES) sector” changed over the last 10 years? RES has already increased their share from 26% of total power capacity in 2005 to 47% in 2017. 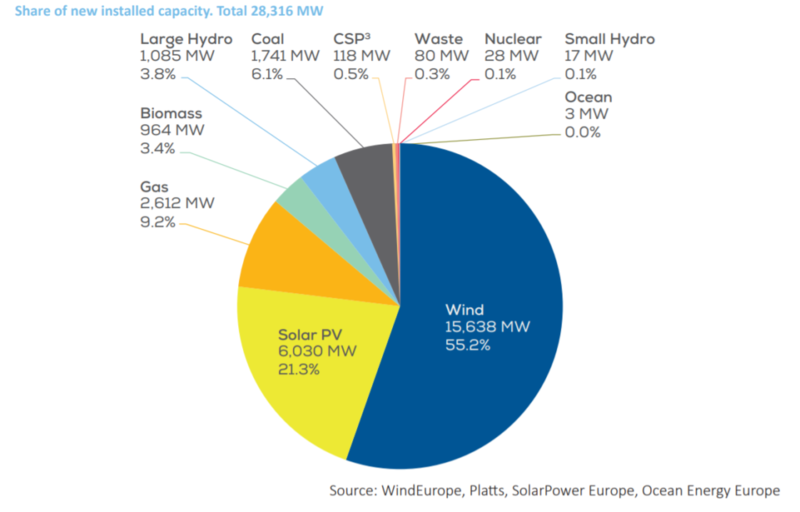 By 2017, the total RES capacity installed in the EU was 455 GW, 169 GW was in wind and 107 GW in PV, both accounting for 29.5% of the EU power mix. 2.2: Why is energy transition an irreversible process in most countries? As far as the EU power system is concerned, the energy transition to RES is today consistently seen an irreversible process. It evolved from a timid policy-driven process to a mainstream investment that will have substantial impact on the economy of the next decades. Europe is certainly going for green growth. 2.3: What would happen if the intermittent renewable energy became a main source of power generation? Electricity generation from intermittent RE sources (wind, PV) fluctuate over time due to the varying availability of wind and sunshine. This poses a challenge to the power system. Even improved operations and system-friendly intermittent deployment practices might be insufficient to manage high shares of VRE in the long term. Also, the variability of intermittent generation and other adverse effects can lead to a drop in system value. 2.4: What would be the consequences of maintaining an imbalance between manageable and intermittent generation? The increasing share of variable renewable generation is fostering policy makers and regulators to reconsider power market designs and system planning and operation. The more installed capacity in intermittent generation, the higher the probability to face such an imbalance between supply and demand. For covering the afternoon-evening peak, the penetration of intermittent generation in such systems needs to be backed by fossil-fuel plants – with a large share of combined cycles. In short, policy makers, regulators and power system operators around the world must adjust and ensure no interruption to the continuous transition to renewable systems while promoting the growth in variable renewable power. It is essential to pursue an efficient combination of measures. 2.5: Why does it take long to understand this at EU political level ? It is because that RES in general is often not seen as a tool for its own system integration. Policy priorities during the early days of VRE (wind, PV) deployment were simply not focused on system integration. Instead, past priorities could be summarised as maximising deployment as quickly as possible and reducing the LCOE as rapidly as possible. However, this approach is not sufficient at higher shares of VRE. Innovative approaches are needed to trigger advanced deployment and unlock the contribution of manageable VRE technology to facilitating its own integration. 2.6: Why is the System Value not considered in energy policy frameworks generally? It is because mechanisms are needed to provide sufficient long-term revenue certainty to investors calculating the precise system value can be challenging and the current and future SV will differ. 2.7: What are the verified technical and economic impacts in countries that launched a STE deployment program? for the purposes of the “energy transition”, a reasonable priority of dispatch was given to renewable energies. 2.8: What are the key drivers of STE deployment? Are they all relevant at the same time? 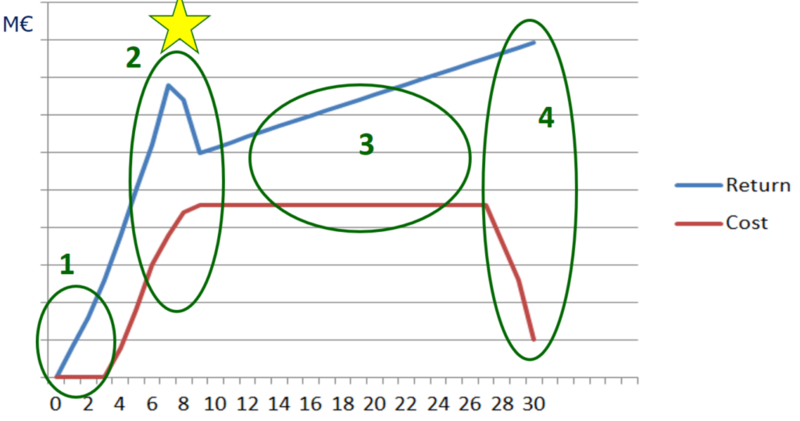 the effects of which appear on different time scales. 2.9: Which are the macroeconomic drivers? According to the Alianza por la investigación y la Inovación Energéticas (ALINNE) in 2015, STE plants are the ones creating more jobs since their construction to their start in operation. Each 50 MW plant employs an average of 10,000 persons/equivalent/year during all the stages (from design, to component manufacturing and installation), half of these jobs are direct and half indirect. Furthermore, each 50 MW plant built in Spain employs 2300 persons/year on manufacturing of components and construction on-site during the two years of construction. Once in operation, they require 50 permanent jobs. Indeed, local economic development (i.e. the local content of STE plants and their contribution to GDP) remains one of the main drivers behind the supporting policies in many countries of the sun belt. 2.10: Which are the cost reduction drivers? Soft costs have an important impact on competitiveness and innovation. Best use of all three predominant types of STE technologies. Delivering higher system value compared to other intermittent renewable energy sources. Complementarity with other RES technologies so as to achieve a “higher value compared to other, intermittent RES”. 2.11: What are the barriers to STE deployment in Europe? 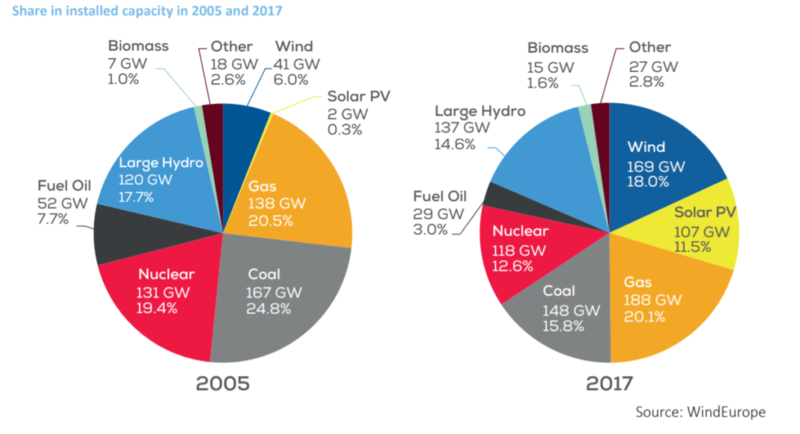 What has the “renewables (RES) sector” changed over the last 10 years? The early investment incentives, decisions and politically ambitions promoted in several countries in EU and beyond to achieve an “energy transition” made the concept of RES evolve. Why? In 2018 and also the years to come, RES will no doubt increase their penetration into the electric systems aiming at the achieving global climate goals defined by COP21/COP 22 – limiting global temperature increase to 1.5 °C. RES has already increased their share from 26% of total power capacity in 2005 to 47% in 2017. In terms of cost, the average cost of on-shore wind decreased by 35% and the of PV by almost 80% between 2008 and 2015. This increase in the penetration trend is not only due to the environmental emission constraints but also due to the fact that at least some RE sources are already cheaper than conventional energy. 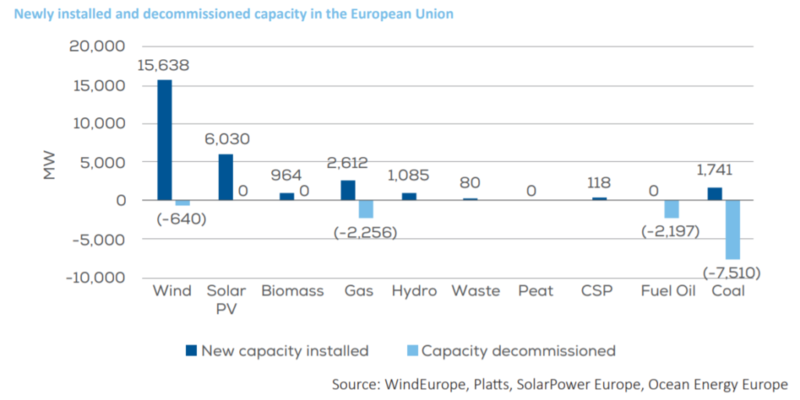 By 2017, the total RES capacity installed in the EU was 455 GW, 169 GW was in wind and 107 GW in PV, both accounting for 29.5% of the EU power mix. Wind power was the energy technology with the highest capacity installations in 2017. With 15.6 GW, it accounted for 55.2% of all new installations. But other renewable energy recourses, such as biomass, geothermal, solar thermal electricity, etc., are technologically able to reliably integrate such and even more volumes of intermittent generation sources remained much less deployed in Europe, only accounted for X% in Europe. Somehow these manageable renewable energy recourses seem to be forgotten in today’s mix of energy use. The result is a massively unbalanced ratio between intermittent and manageable renewable generation sources in Europe which will lead to unsustainable electrical systems in the Member States especially when conventional plants will be decommissioned and their capacity need to be replaced. Why is energy transition an irreversible process in most countries? The COP21 confirmed the imperative commitment of the international community to decarbonize the planet. Much in line with this success, the Juncker Commission had set Europe becoming Nr1 in RES as the highest priority target. As far as the EU power system is concerned, the energy transition to RES is today consistently seen an irreversible process. It evolved from a timid policy-driven process to a mainstream investment that will have substantial impact on the economy of the next decades. Europe is certainly going for green growth. However, the proper development of the “RES sector” that started in the late 90ies as a “niche market” that did not impact the utilities. The power market is today the most important investment driver for new generation in Europe. What would happen if the intermittent renewable energy became a main source of power generation? The success of wind and PV is driving change in power systems not just in Europe but also around the globe. Electricity generation from both technologies is constrained by the varying availability of wind and sunshine, which makes the output of intermittent RE sources fluctuate over time. This poses a challenge to the power system. Power system operation and planning are needed to be upgraded and adapted to accommodate more intermittent on the grid. Even improved operations and system-friendly intermittent deployment practices might be insufficient to manage high shares of VRE in the long term. Thus, additional investment in flexible resources becomes necessary. Also, when the share of intermittent generation increases, the variability of intermittent generation and other adverse effects can lead to a drop in SV. What would be the consequences of maintaining an imbalance between manageable and intermittent generation? In a future grid with a high percentage of intermittent, fluctuating generation, like wind and PV, controllable and dispatchable generation will have to play a much larger role in filling the gaps in the system, according to a recent study “Evaluating the value of concentrated solar power in electricity systems with fluctuating energy sources” performed by Institute for Power Electronics and Electrical Drives, RWTH Aachen University based on a new computational tool. The increasing share of variable renewable generation is fostering policy makers and regulators to reconsider power market designs and system planning and operation. Depending on local circumstances, variability of renewable energy can raise some challenges for power system operations, especially at higher market shares. Integrating distributed and VRE into the power sector requires efforts at both the system and market level. System considerations for increased renewable power deployment relate to concerns with power system adequacy and operation, power production, demand scheduling and balancing within the physical constraints of the interconnected power grid. Market considerations relate to the effects of varying degrees of renewable capacity deployment on power market design and operation, and to the implications for cost recovery of other critical system components (e.g. distribution networks and reserve generating capacity). In Europe: This leads often to a restriction or even curtailment of the operation of renewable plants and to an increase of the costs of ancillary services for balancing the system, as for instance, in order to have sufficient spinning and short-term power reserve available in case of a rapid drop in the supply from intermittent renewable sources. Business cases for intermittent generation technologies will become uncertain and unviable from a certain penetration share. In other words, the more installed capacity in intermittent generation, the higher the probability to face such an imbalance between supply and demand. In emerging economies: there is often a need to increase generation capacities in all timeframes at a high rate – doubling in a decade – and especially for covering the afternoon-evening peak; therefore, the penetration of intermittent generation in such systems needs to be backed by fossil-fuel plants – with a large share of combined cycles. a barrier to achieving a truly carbon-free generation system. In short, policy makers, regulators and power system operators around the world must adjust and ensure no interruption to the continuous transition to renewable systems while promoting the growth in variable renewable power. It is essential to pursue an efficient combination of measures as local conditions dictate. Why is the System Value not considered in energy policy frameworks generally? “Reflecting “System Value” (SV) in policy frameworks requires striking a delicate balance. On the one hand, policy makers should seek to guide investment towards the technology with the highest SV compared to its generation costs. On the other hand, calculating the precise SV can be challenging and, most importantly, current and future SV will differ. In practice, exposure to short-term market prices can be an effective way to signal the SV of different technologies to investors. However, the current SV of a technology can be a poor reflection of its long-term value. This is due to transitional effects that can be observed in a number of countries where VRE has reached high shares. For example, in European electricity markets the combined effect of renewable energy deployment, low CO2 prices, low coal prices and negative/sluggish demand growth (slow economic growth, energy efficiency improvements) are leading to low wholesale market prices. In turn, these low prices mean that any new type of generation will only bring limited cost savings and will thus have a low short-term SV. Even where electricity demand is growing more rapidly, investments based purely on expected short-term wholesale power prices face multiple challenges. Because wind and solar power are very capital intensive, such challenges will directly drive up the cost of their deployment, possibly widening the gap between SV and generation costs. In addition, current market price signals may be a poor indicator of SV in the longer term. Consequently, mechanisms are needed to provide sufficient long-term revenue certainty to investors. At the same time, such mechanisms need to be designed in a way that accounts for the difference in SV between generation technologies. A number of strategies have emerged to achieve this. Two relevant examples are market premium systems, which reward VRE generators that generate higher-than-average value electricity, and advanced auction systems, such as the model recently introduced in Mexico, which selects projects based on their value to the system rather than simply on generation costs. As next-generation wind and solar power grow in the energy mix, a focus on their generation costs alone falls short of what is needed. Policy and market frameworks must seek to maximise the net benefit of wind and solar power to the overall power system. A more expensive project may be preferable if it provides a higher value to the system. System value (SV) is defined as the net benefit arising from the addition of a given power generation technology, a look beyond costs/LCOE. What are the verified technical and economic impacts in countries that launched a STE deployment program? What are the key drivers of STE deployment? Are they all relevant at the same time? However, when integrated into 2 simple curves (costs and benefits) the cost curve never breaks across the higher benefits curve. The impacts of STE deployment are delivered at macroeconomic level on a short time scale: nearly immediately following the implementation of the political deployment decision, macro-economic effects take place via the creation of new jobs and new tax income. Then innovation effects including learning effects and technology improvements in demonstration projects become relevant at mid-term, with a perspective to introduce them in a blooming home market. Finally, the cost reduction effect that is building on incremental innovations brought to markets kicks in essentially over market volume at a longer-term, which is the time scale that should be primarily considered for sustainable energy strategies. Which are the cost reduction drivers? Industry must scale up in a home market: the most significant technological advancements and cost reductions are expected in the future provided that the STE industry can scale up, which will make operating experience improve, technological innovations roll out of R&D labs. The result will also be a larger, hence more competitive supply chain, both locally and globally (IRENA 2015). The soft costs, sometimes referred to as non-hardware balance of system (BOS) costs or business process costs, include marketing and customer acquisition, environmental assessment, system design, installation labour, permitting, inspection, profit, and overhead have also an important impact on competitiveness and innovation. Some of the soft cost categories (e.g. environmental assessment of large plant development) are applicable to both PV and CSP. However, overall CSP costs remain more dominated by hard costs than are PV installations. Best use of all three predominant types of STE technologies – parabolic troughs, LFRs and central receivers (towers): Novel optic designs are being considered, as well as new mirror materials and receiver designs. Tower designers are also exploring choices relative to the type of receivers (cavity or external), the number and size of heliostats, the number of towers associated with each turbine, and the size and shape of solar fields (IEA 2014b). Within the different STE technologies, there are different maturity levels, with parabolic trough and solar tower being commercially proven, only early commercial projects for linear Fresnel (IRENA 2015). While higher capital costs make a technology obviously less attractive than its competitors, this is only one side of the economic equation. The other side is the benefits of the technology for the adopter. 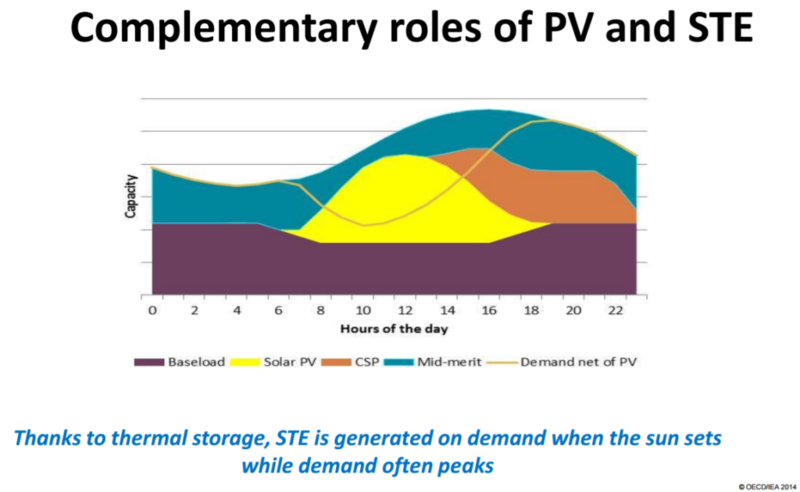 STE has two very attractive features in this regard: adjustment to the demand profile and energy storage, which allows STE to provide firm electricity, even when the sun does not shine. STE can integrate low-cost thermal energy storage to provide intermediate- and base-load electricity. This can increase significantly the capacity factor of STE plants and the dispatchability of the generated electricity, thus improving grid integration and economic competitiveness of such power plants. Although STE plants with thermal energy storage tend to have higher investment costs, they allow higher capacity factors, dispatchability, contribute to grid balancing, spinning reserve, and ancillary services, and typically have lower LCOEs (particularly for molten salt solar towers) (REN21 2013). They also have the ability to shift generation to when the sun is not shining and/or the ability to maximise generation at peak demand times (IRENA 2015, IEA 2014b). Therefore, the thermal storage capability of STE plants not only increases their value, it also reduces the cost of electricity. There is a growing trend for the STE projects under construction to include storage systems, which will be the norm for this type of projects in the future (EurObserv’ER 2014). This advantage will only gain in importance as variable renewable energy sources such as PV and wind power increase their shares of global electricity (IEA 2014b). Smart support mechanisms: Given the cost gap compared to other technologies, a main driver for STE in the past has been support policies. According to IRENA’s “Rethinking energy 2017”, since STE deployment still associates with higher technology and financing risks, thus this will for some more years still depend on mobilizing public support which several countries in Europe can provide. deployment support (at MS level). Both have led to technological improvements and cost reductions. In the EU, national STE deployment has been considered in NREAPs (Spain, Portugal, Greece, Germany, Cyprus, France and Italy). But besides the always necessary European home market, EU companies also can benefit from policies implemented around the world to support STE, as this will allow technological advancements and cost reductions which will lead to either faster or less costly deployment of the technology in the EU. 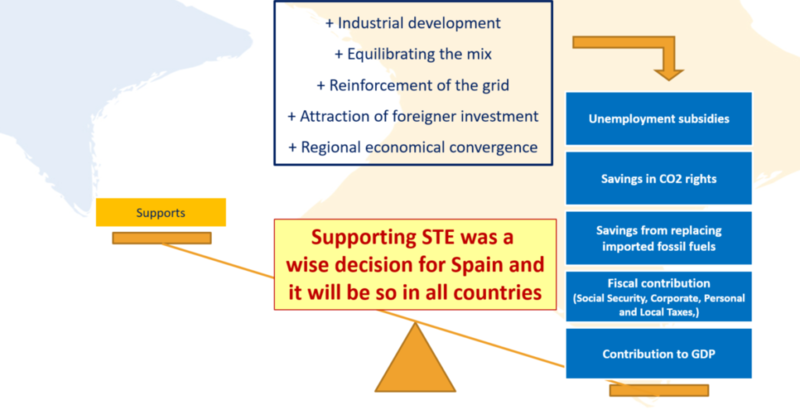 At present, many countries outside Europe have policies in place to support STE deployment (e.g. Algeria, Australia, China, Egypt, India, Morocco, South Africa, United Arab Emirates and the United States). According to IRENA’s “Rethinking energy 2017”, investment in Africa and the Middle East increased by almost 75% in 2015 to around 12 Bn US$ – focusing on PV and STE, which accounted for 77% of total global investment. According to the latest study published in Nature Energy from Johan Lilliestam and his colleagues from ETH Zürich, Switzerland, the study’s analysis concluded that continuity in both policy support and project developer and component manufacturing industries are important to keep the learning rate high. Policy support mechanisms with stronger competitive elements were found to lead to the highest cost reduction over time. Complementarity with other RES technologies so to achieve a “higher value compared to other, intermittent RES”. This complementarity relates to the possibility that, in the future, PV and STE may complement each other since the value of STE will increase further as PV is deployed in large amounts, which shaves mid-day peaks and creating or beefing up evening and early morning peaks. What are the barriers to STE deployment in Europe? Regulatory and policy uncertainty barriers, which relate to bad policy design, or discontinuity and/or insufficient transparency of policies and legislation. Institutional and administrative barriers, which include the lack of strong, dedicated institutions, lack of clear responsibilities, and complicated, slow or non‐transparent permitting procedures. Market barriers, such as inconsistent pricing structures that disadvantage renewables, asymmetrical information, market power, subsidies for fossil fuels, and the failure of costing methods to include social and environmental costs. Financial barriers associated with an absence of adequate funding opportunities and financing products for renewable energy. Infrastructure barriers that mainly centre on the flexibility of the energy system, e.g. the power grid, to integrate/absorb renewable energy. Public acceptance and environmental barriers linked to experience with planning regulations and public acceptance of renewable energy. Expectations about cost reductions: Cost reductions between 30-50% are expected for both parabolic troughs and tower technologies (IEA 2013). Estimates of 8-10% based on other technologies are considered conservatively realistic (IEA 2013). A recent study by KIC InnoEnergy (2015a) shows that, for all STE technology types, the impacts from STE technology innovations (excluding transmission, decommissioning, pre-FID risk, supply chain and finance effects) contribute an anticipated reduction in the LCOE of at least 23.6%. According to ESTELA, this cost reduction trend necessarily requires a minimum volume of projects, which has been estimated at some 30 GW worldwide by 2025. The first threshold of 10-12 €/kWh will be achieved through lower cost solar collectors and construction techniques; while 8-10 €/kWh will be the result of reaching higher temperature system and mass production. Central receiver plants can certainly be supportive to this process. Morocco: the PPAs of the two recently awarded STE plants in Morocco Noor 2 & 3 (200 MW PT & 150 MW T) were 15% lower than the previous one of Noor 1 awarded 2 years ago. Chile: a 110 MW STE plant, with 17.5 hours of storage, partly hybridized with PV, was recently selected in Chile with a PPA of $110/MWh, in competition with all other generation technologies including Gas Combined Cycle. South Africa: the tariff for the current “Expedited Round” in South Africa is close to 20% less than the previous one for Round 3 established 18 months ago. Dubai: More recently, the Dubai authorities have outlined a three-year construction window for a 200 MW solar tower facility, the United Arab Emirates' second CSP plant. The Dubai Electricity and Water Authority (DEWA) is to award the contract for the project in the second half of 2017 and expects the facility to be online by April 2021. DEWA announced on 4 June the prices offered from four consortia for the 200-MW fourth phase of the Mohammed bin Rashid Al Maktoum solar park. The lowest bid for the Solar Thermal Electricity (STE) project came in at 9.45 US cents/kWh (approx. 8.4 €cts/kWh). Participating consortia were [ACWA Power (Saudi Arabia), Shanghai Electric (China), BrightSource (USA)]; [Alfanar (Saudi Arabia), Suncan (China)]; [Engie (France), SolarReserve (USA), Power China (China), Sepco3 (China)] and [Masdar (UAE), EDF (France), Abengoa (Spain), Harbin Electric (China)]. Three of the best bids offered by multi-national players are hitting or even below 10 €cts/kWh while the installed capacity in STE worldwide is just around 5 GW compared to nearly 500 GW for wind and 300 GW for PV. In other words, STE costs were divided by 3 in just 10 years (2007-2017) with just 1% of the market volume for wind and less than 2 % of the market volume of PV! On 16 Sept, DEWA announced that the contract is awarded to a consortium comprising Saudi Arabia’s ACWA Power and China’s Shanghai Electric. The consortium bid the lowest LCOE of USD 7.3 cents per kilowatt hour (kW/h). The project will have the world’s tallest solar tower, measuring 260 metres. The power purchase agreement and the financial close are due to be finished shortly. The project will be commissioned in stages, starting from Q4 of 2020. This comes already after SolarReserve offered 6.54 US cts/kWh in Chile in August 2016 for a STE 120-MW plant, where in addition to the best solar resource in the world, the country’s stable financial status along with US dollar denominated power contracts results in excellent financing and investment terms. Costs of capital: The economics of STE plants are highly dependent on the costs of capital. STE, as other RETs, is a capital-intensive technology and, thus, the high up-front costs represent a major barrier. The investment and financing costs account for more than 80% of the electricity cost, the rest being fixed and variable O&M costs (IEA 2013) and, thus, their reduction would significantly reduce the LCOE. According to IEA (2014b, p.24), “the most significant ways of reducing costs are lower capital expenditures and lower costs of capital”. Different designs and technological competition. Innovation theory predicts that at the early stage of a technology, different designs compete between each other. This is also the case with STE . The sector is still commercially validating the various technology approaches on the solar field. The technologies are still competing with one another and it is very hard to predict which technology will come out on top (EurObserv’ER 2014). Up to this moment one design has been dominant (trough) but, solar towers are expected to capture an increasing share of the market in the future. Resource potentials in Europe: STE plants can be sited only in areas with adequate solar resources (ideally, with direct sunshine in excess of 1900 kWh per m2 per annum), which restricts its potential deployment in Europe to the Mediterranean area (Spain, Southern Italy, Southern France, Greece, Cyprus and Malta) (EurObserv’ER 2014). Direct normal irradiation can reach 2000 kWh/(m²a) in Southern Spain which is high compared to other EU countries, but low compared, e.g. to the 2500 kWh/(m²a) corresponding to the MENA region (Kost et al 2013). As a result, its highest growth potential is outside Europe, in the so-called Sun Belt region (between 40 degrees north and south of the equator). This region includes the Middle East, North Africa, South Africa, India, the Southwest of the United States, Mexico, Peru, Chile, Western China, Australia, southern Europe and Turkey (IEA 2013)9. Competition or complementarity with solar PV: Direct competition from the other large category of solar technologies (solar PV) is also to be mentioned as a potential barrier for STE in the future. Some authors even argue that this competition may be already delaying the deployment of STE in some parts of the world. For example, IEA (2014b) notes that deployment in the United States was slow until 2013 because of long lead times and competition from cheap unconventional gas and from photovoltaic (PV) energy, whose costs decreased rapidly. The STE IEA Roadmap (IEA 2014b) shows that the rapid deployment of PV has delayed the deployment of STE, although it is unlikely to impede it in the longer term. Although competition between solar technologies might have led to low deployment of CSP, in the future they will complement each other and even reinforce each other, turning a case of technological competition into one of technological complementarity. The value of STE will increase further as PV is deployed in large amounts, which shaves mid-day peaks and creating or beefing up evening and early morning peaks. STE companies have begun marketing hybrid projects associating PV and STE to offer fully manageable power at lower costs to some customers (IEA 2014). Finally, EU Policy-makers use to allege to the fact that a country has no (good enough) potential for installing STE plants, ignoring the benefits to be reaped by industry on world markets, for not re-launching the STE market in Europe.